Dog health problems can crop up at any stage of a dog's life. The pet that happily goes through life without ever experiencing one or more of the myriad dog health problems these animals can be prone to is a rare pet indeed. More likely, most dogs will face at least one minor health issue at some point in their lives. Although there are many illnesses and other conditions that can adversely affect your dog's health, some are more common than others. The following table reflects many of the most prevalent diseases, injuries, and chronic conditions that our beloved canines face. Allergies Immune system response to food, plants, parasites, pollens, mites, molds. Arthritis May be hereditary or brought on by obesity. Bloat Specific cause unknown, but may be brought on by food allergies, or hereditary factors. Bowel Obstructions Bones and other items lodged in the intestines. Broken Bones Low calcium intake, injury. Brucellosis Contact with infected bodily fluids. Cancer Hereditary factors, exposure to known carcinogens. Canine Diabetes Inability of the pancreas to produce proper amounts of insulin. Canine Epilepsy Misfired electrical signal caused by brain lesions. Canine Hip/Elbow Dysplasia Hereditary factors, malformation of joints. Cataracts Eye irritants, old age. Choking Blockage of the windpipe caused by food, aspirated liquids, and other items. Coronavirus Exposure to infected animals, and body fluids. Cushing's Disease Over-production of cortisol by the Hypothalamus gland that interrupts normal brain communications. Deafness Congenital defects, chronic ear infections. Diarrhea Bacterial/Viral infection, change of diet. Distemper Ingesting/Inhaling virus from stools, mucus, and vomit of infected animals. Dog Flu Viral respiratory infection. Ear Infections Build up of fluids and waxy secretions in the ear canal that promotes bacterial growth. Ear Mites Exposure to other infested animals. Electrical Shock Chewing on live electrical cords. Eye Infections Ingrown eyelashes, accidental damage to eye tissues leading to secondary bacterial infection. Flea Infestation Exposure to grassy areas, other infested animals. Frostbite Over-exposure to extremely cold temperatures, neglect by owner. Heart Disease Congenital disorders, obesity, hereditary factors. Heatstroke Over-exposure to high temperatures, leading to dehydration. Hot Spots Secondary condition to allergies and parasitic infections, brought on by licking, scratching and chewing. Hyperglycemia Body is unable to properly use insulin, related to obesity and diabetes. Hypoglycemia Malfunction of the pancreas leads to low blood sugar levels. Hypothermia Loss of body heat brought on by exposure and/or neglect. Kennel Cough Exposure to airborne bacteria, and viruses. Leptospirosis Bacterial infection brought on by exposure to infected body fluids. Liver Disease Hereditary factors, viral/bacterial exposure, Hepatitis. Lyme Disease Infection cause by the bite of an infected tick. Obesity Many causes including over-eating and lack of exercise, and thyroid gland malfunctions. Parvovirus Exposure to infected animals and body fluids/stools. Periodontal Disease Gum infections brought on by build up of harmful bacteria, plaque, and tartar. Progressive Retinal Atrophy Deterioration of the retina, hereditary factors. Pyometra Bacterial infection of the uterus sometimes contracted through breeding, spontaneous abortion, and retained placentas. Rabies Exposure to the rabies virus through the bite of an infected animal or exposure to infected body fluids. Skin Infections/Diseases Parasitic infections, allergies. Sting Complications Allergic reaction to venom, causes mild to life threatening immune responses. Suffocation Blockage of the windpipe, newborns being laid on by Dam, severe allergic reactions. Vomiting Dog flu, viruses, bacterial infections, change of diet, garbage eating, poisoning. Worms Parasitic infestation brought on by ingesting worm ova found in infected dirt, stools and vomit. While it isn't always possible to keep your pet perfectly healthy, following these guidelines should give your pet an advantage over becoming ill. Always offer your dog the best nutrition possible. Make sure your pet gets plenty of appropriate exercise. Follow your vet's vaccination recommendations, and follow through with annual well-dog check ups. 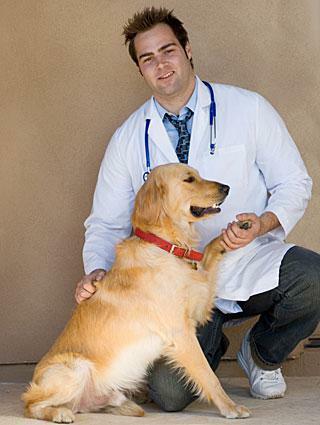 Have your dog checked annually for intestinal worms and de-wormed if necessary. Have your pet checked annually for Heartworms, and keep him on preventative during peak season. Keep your dog clean and groomed to lessen the chance of skin infections, diseases, and parasitic infections. Brush your dog's teeth every week to reduce the chances of periodontal disease. Don't forget to give your pet lots of affection and firm but fair discipline to help keep him mentally healthy as well.